Play Canfield Solitaire For Free ! Each player is allowed one entry on the Canfield global leaderboard. If you achieve more than one score then your lower score will be removed. This helps prevent the leaderboard filling up with scores from the same player. The scores reset at midnight PST every Sunday and Last Week's Best players are shown on the right. 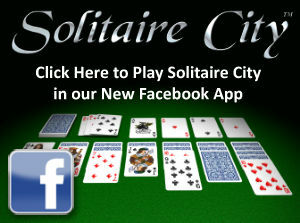 If you like this version of Canfield Solitaire then please consider playing it in our Solitaire City App available as a FREE download for iPhone, Android, BlackBerry, Windows, Macintosh and FaceBook. Canfield Objective: A card is dealt to the first foundation. Use its rank as the base for the other three foundations and build them up in ascending sequence until each contains 13 cards of the same suit, "turning the corner" from King to Ace; e.g. 13 cards are dealt to a reserve column, the topmost exposed card of which is available for play. Build tableau columns down in a descending sequences of alternating colours; e.g. Tableau columns may also turn the corner from Ace to King; e.g. Click on the face down stock to deal cards three at a time to a face up waste pile. The topmost, card from the waste pile may be moved, along with the exposed reserve card, single exposed cards at the end of each tableau column or a packed sequence of tableau cards. An empty space in the tableau is automatically filled by the exposed card in the reserve, releasing the card below it. If there are no cards left in the reserve then empty spaces in the tableau may be filled by a card from the waste pile, but not necessarily immediately. For more detailed information about Canfield Solitaire, please click here.